This great home at 25892 Milano Lane, Valencia, CA, 91355 is located in the popular San Marino tract in the Valencia Summit and has 2 bedrooms and 2 baths and 1300 square feet. This home is located off McBean Parkway. Close to Santa Clarita & Valencia paseos and hiking trails. Great schools. See more below. 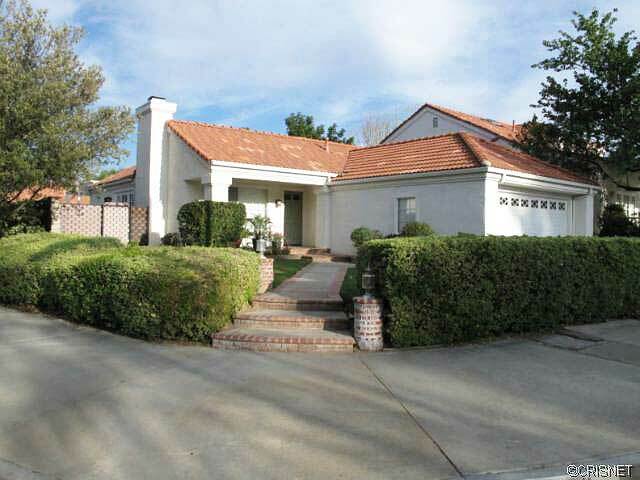 Check out this New Listing added on 02/26/2014 in the Valencia CA real estate area of Santa Clarita homes for sale. Stunning 2+2 San Marino on Sweeping Manicured Corner Lot. Completely remodeled like no other! Floor has been leveled to create a large Open Concept Great Room with fireplace, vaulted ceilings, new up-graded designer laminate flooring & Upgraded 6″ base boards all open to landscaped Atrium. Large Chefs Kitchen with extra large breakfast bar, Cherry wood cabinets, Granite countertops, GE stainless steel gas range, microwave, dishwasher & Samsung stainless steel refrigerator. Extra large-under mount kitchen sink with designer faucet, Upgraded lighting, Extra storage pantry cabinets with additional cabinetry under breakfast bar. Master Bedroom has new full length mirrored sliding doors on closet & extra storage. Master Bathroom with Cherry wood cabinetry, 36″ high Granite countertops with under mount sinks and new faucets & extra full length cabinet storage. Recently painted with designer colors & full window coverings throughout. Manicured rear yard perfect for relaxing or entertaining. Newer garage door, gas water heater, a/c condensing unit & exterior light fixtures. This is truly an exceptional home with no zero lot line (full fenced yard access on all sides). Your name is not required, however, a first name would help me address you more personally. Please include a phone number if you would like to be contacted by phone. Please include a property address if you have a question about a particular property. It is not automatically included. Thank you. Please indicate which home you are asking a question about. This will enable a quicker response to your question. What is the value of my Valencia home? Please provide square footage and any other information that would help me in the valuation. i.e. granite counters and other upgrades. Please check the box that most closely represents your requirement. Thank you. Not required. This Valencia CA home for sale at 25892 Milano Lane, Valencia, CA, 91355 is located off McBean Parkway. with great access to the Golden State Freeway. This is a standard sale. See other listings in Valencia CA .